Recruitment as a career is the epitome of the phrase “trying to find a needle in a haystack”. Economic fluctuations, demand in a particular sector, an overabundance of graduates with a particular qualification – all of these things and more can lead to some jobs having hundreds – or even thousands – of applicants rushing for a single position when it crops up. With so many individuals competing for a dramatically smaller number of jobs, how do recruiters find ways to make their lives easier and their jobs more manageable? This is where artificial intelligence (AI) can play a role. In today’s article, we’ll take a look at the impact of AI on recruitment: its uses, pros, potential pitfalls and the future. First things first. AI stands for artificial intelligence. Put simply, this involves software being able to execute tasks that are usually carried out by humans. This includes – among other things – decision making, visual and vocal recognition, and translation. Recruiters and agents have been using AI for years, and its origins were modest and relatively simple. For example, using an AI-powered Applicant Tracking System (ATS) to scan through hundreds of CVs and look for keywords or phrases is now fairly common. As such, AI technology presents a great way for recruiters to thin the herd quickly and efficiently. The use of AI to quickly scan through CVs often leads to criticism from job seekers though. They argue that the technology reduces a person’s CV to a simple ‘yes or no’ purely based on a keyword search while that decision should be based on the quality of their experience and/or personality traits. The problem, however, is that the alternative for recruiters is to read and evaluate every single CV separately. In the earlier example of a job position with thousands of applicants, this would take weeks – if not months. All while the applicants are eagerly waiting to hear back. With 52% of recruitment leaders saying that identifying the right candidates from a pool of applicants is the most challenging part of their job, it seems clear that the experts feel this isn’t a task that can be done with people power alone. There are many – many – other examples of the use of AI in recruitment. 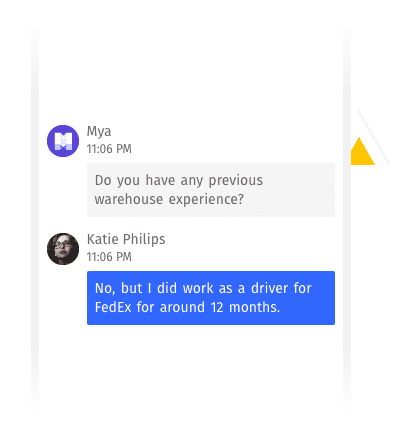 Just to give you an idea: applications of AI can help with the sourcing, pre-selection and onboarding parts of your hiring process. Other tools can answer candidate questions and set up interviews. And the list goes on. We won’t be able to cover all of these technologies today but we will look at some of them. Most recruiters are very busy people. In that regard, the more tedious, time-consuming tasks that can be automated, the better. The use of an AI-driven chatbot, for example, can remove heaps of these mundane tasks. Think of answering (simple) candidate questions, scheduling interviews and screening applicants for instance. Things that certainly are important and need to be done, but that can also easily be automated. Alexander Mann Solutions is one of the companies that use AI-infused technology to automate processes such as scheduling interviews and sending out job offers. Mya doing her chatbot magic. When it comes to finding the perfect candidate for the job, the last thing we want is for our judgment to be clouded by bias. Fortunately, there are some interesting applications of AI in recruitment that can help reduce bias. There are tools out there to help recruiters write a bias-free job advert for example. Textio is probably one of the company’s that’s most-known for this so-called augmented writing technology. AI-powered preselection software uses predictive analytics to calculate a candidate’s likelihood to succeed in a role. This allows recruiters and hiring managers to make data-driven hiring decisions rather than decisions based on their gut feeling. Pymetrics is an example of a company that’s active in this space. AI-powered software can analyze people’s online presence such as their social media profiles and public data. The technology can make predictions based on this data. For example about how likely people are to accept a job and what roles they might be interested in. It can also analyze the profiles of candidates who have already started a job within the company. By combining all the available information, the software can identify candidates with similar personalities and skills. It can decipher which candidates might be interested in certain roles and directly target relevant job adverts at them. PandoLogic uses AI to make talent acquisition more efficient and effective. Let’s go back to that AI-infused chatbot we mentioned. It never takes a day off, which means it’s always ready to answer candidate questions. Even at midnight. Or on a Sunday afternoon. As such, it can guide the candidate through the recruitment process more efficiently; instant answers right when they need them. And this is just one example of how adding AI instruments to your recruitment process can improve the candidate experience. Sure, when used correctly, the use of AI-powered technology in recruitment can have tremendous benefits. However, there are potential pitfalls too. Technology can use AI to detect certain subtleties in candidate behavior during a video interview for instance. But who’s to say that an applicant’s body language isn’t simply due to him or her being nervous rather than them cheating? Human qualities such as empathy and contextual understanding are still (almost) impossible to replace with software. Another tricky situation. An AI-driven recruitment tool might identify a candidate as having all the necessary experience based on a keyword search. But will it miss the fact that the same candidate has changed jobs four times in one year? An often heard fear is that of AI replacing humans, displacing many from their jobs. While there certainly will be an impact, it’s not as bad as many people seem to think. In most cases, AI and automation will only take over those repetitive, easy-to-automate tasks we mentioned. As such, this will enable us, humans, to focus on more interesting tasks. Artificial intelligence is changing the recruitment industry. There are already some tremendous, AI-driven applications out there and their number is likely to go up (a lot). Whether you like it or not, if you don’t at least look into the possibilities of AI for your organization, you’ll be missing out. Not because it will replace the people in your company, but because it will free up their time to do more important things. Such as listening to and empathizing with candidates when they need to. So try out some new tools, software, and programs to see what works for your organization. That way you can create an automated recruitment process that will eventually improve your quality of hire, your candidate experience and – perhaps most importantly – the everyday working lives of your recruiters. Ethan Lee writes for Inspiring Interns, a leading UK graduate recruitment agency that specializes in finding candidates their perfect internship.